For a range of bargain cartridges for HP P3015d laser printers, then you can find anything you need and more here on Cartridge Save. We feel it is best to feature toners of the leading quality that are manufactured to function perfectly with your printer. For P3015d laser printer supplies which you do not need to worry too much about, order from Cartridge Save right now! You get complimentary next day delivery which applies to anything bought with Cartridge Save. Cartridge Save consider speedy delivery as really important, resulting in 98% of all orders arriving on the next day. You can get total peace of mind if you place an order from us because of the extensive refund scheme. In case you encounter any hassles using your HP P3015d laser printer cartridge after purchase you only have to send it back for a 100% reimbursement. Buy the highest quality cartridges and save at Cartridge Save! Ideal for monochrome printing needs, the HP LaserJet Enterprise P3015d is especially designed for medium to large office environments. The HP P3015d laser printer offers excellent printing rates, efficient paper handling and expandable options, making it ideal for the growing workgroup. The HP LaserJet Enterprise P3015d mono laser printer is designed for heavy-duty use and features duplex printing as standard. However, an Ethernet or wireless server upgrade is needed if a networkable printer is required. The HP LaserJet Enterprise P3015d may look like every other monochrome laser printer in the market, however, it features a speedy 540 MHz processor and a sufficient 96 MB RAM, allowing fast print rates. The RAM can even be expanded to as much as 608 MB as needed. The LaserJet Enterprise P3015d printer is designed for up to 100,000 impressions per month, making it a suitable choice for offices with high-volume print needs. The HP LaserJet P3015d laser printer has many advantages, starting from its average print speed that reaches up to 40 pages per minute. Its speed does not compromise quality, as texts still appear sharp and refined. Toners for the HP LaserJet Enterprise P3015d also have high page yields. While this machine scores well in performance, the LaserJet Enterprise P3015d printer is still just a single-function monochrome device that may not satisfy more demanding printing needs of larger offices. 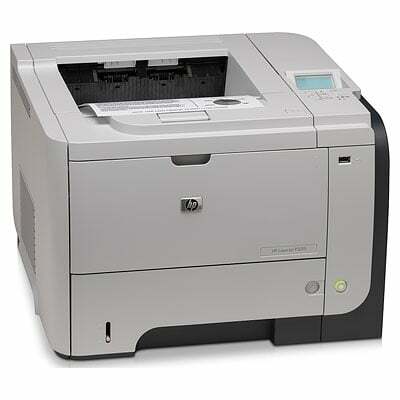 Nevertheless, the HP P3015d is very easy to maintain. Its replacement toner cartridges, while costly, have impressive page yields.